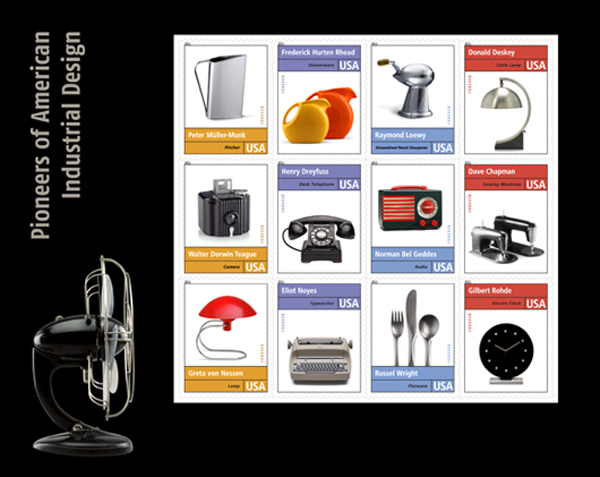 I'm excited to see the Pioneers of American Industrial Design forever stamps coming out, they would look fantastic on an envelope. They come out tomorrow at USPS and big props to the stamp designers lately. What a neat idea! Love these stamps! Love them! But I am partial to the old stamps that have amounts on them. I add them up to total the postage needed... one Gee's Bend Quilts, one Chippendale chair, two Tiffany lamps... I think the multiple stamps add so much more to the outside of an envelope than the forever stamps. I have to buy the old ones on eBay. Whoa, cool! Love that these are being featured. I have to admit, though, at first glace I thought the stamp card was an excerpt from an Ikea catalogue. For shame! I've got too much Ikea in the brain! i just posted these to our facebook page. i was so pumped to see some cool stamps coming out. and it doesn't hurt that they're forever stamps either. I totally love these! I cannot wait to grab some and send out some lovely retro stationary to friends!